Why is This Page Good? 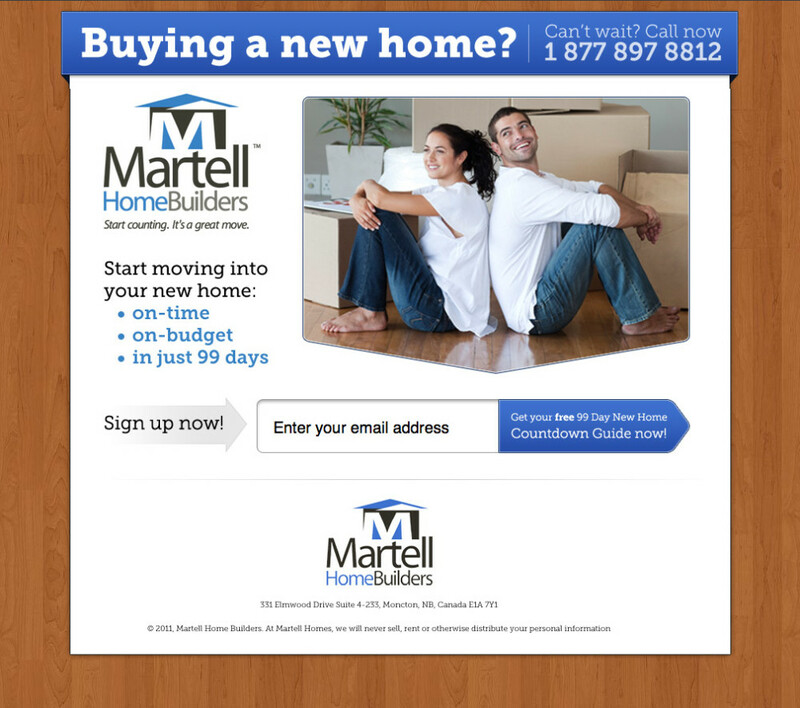 Directional cues: The whole page is designed with directional cues pointing at the email form. There are three in total: the photo points down, the “sign up now” arrow points to the right, and in a subtle way, the roof on the logo at the bottom points up. Very nicely done. Choice of contact method: From testing I’ve done, there is always a portion of your customers that won’t like your chosen method of contact – guaranteed. So offering both email and a phone number gives them options. Trust: Providing a big phone number lets visitors know that there are real people behind the business. Happy photography: There’s a fine line between cheesy stock photography and imagery that really works and this one really works in my mind. Anyone who’s moved can relate to the feeling of moving into a new home (and the associated stress). This image paints a picture of a painless and happy experience. Buying a new home where? : The advertising for this page is probably well targeted at specific geographic locales, but it still produces an element of doubt when the location isn’t included. What do I get? : After reading the CTA, I can see that I’m going to get a 99-day guide. But there’s no visual cue on the page to make me think I’m going to get a report until I’ve already decided I’m ready to go. I’d suggest trying an extended secondary headline, perhaps like this: “Use our free 99-day New Home Countdown Guide – and start moving into your new home:”. That way the expectation is set right away that you’re offering help in the form of a guide. What’s in it? : If you are giving something away (and want people to want it), provide a preview (the first 10 pages or first chapter) so they can see the quality and understand the benefit of doing business with you. Copy tweak: Instead of “Sign up now”, I’d test something less committal like “Get the guide now”. CTA color contrast: This is the point where I’d say that the button should be a different color than the rest of the page to make it stand out, but there are exceptions to every rule. Given that the entire color palette consists of only 4 colors, I sense it would be hard to find something different that wouldn’t ruin the calming aesthetic of the page, so I’m going to leave this one alone. Trust statement: The anti-spam trust statement in the footer about not sharing your email, could be connected to the email form a bit more closely. Whether through an asterisk (*) on the text inside the form to indicate that people should read the statement below, or moving the text to the area directly below the form.